comes time for a community parade everyone comes out to watch. St. Joseph Lodge No. 970 recently had an entry in the St. Joseph, Illinois community parade. Our WM Todd R. Hitt put together the float and I was able to use one of my antique tractors to pull it. It doesn’t get much better for me than getting to drive one of my tractors, pulling our lodge float with lots of brethren and Scouts from my Webelos Den on board. 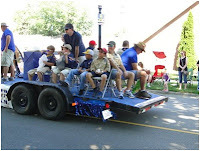 So why bother to be in a parade? Well when we came back to the lodge at the conclusion of the parade, we were approached by a young man who had also been in the parade and was unloading for his business. He came up to us and I could tell he was curious about who we were. Myself and others introduced ourselves to him and we soon found he had been interested in joining our Lodge for some time, but wasn’t sure who to make contact with. WB Hitt gave him a tour of our lodge and spoke with him about what our lodge does and he came out with a petition in hand. The perspective candidate was very excited and promised to be back in touch with the completion of his petition. It just goes to show that you never know where your next new brother may come from. Being actively involved in your community is one sure way to spark some interest in your lodge. P.S. for you tractor buffs, I was driving a 1949 McCormick-Deering O-4 orchard tractor. This tractor is a fairly rare model and spent its working life in the orchards of the University of Illinois. 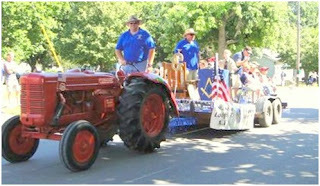 I acquired the tractor a few years ago and its now mostly on parade duty. WB Gregory J. Knott is the Past Master of St. Joseph Lodge No. 970 in St. Joseph (IL) and a plural member of Ogden Lodge No. 754 (IL), and Homer Lodge No. 199 (IL). He's a member of both the Scottish Rite, and the York Rite, and is the Charter Secretary of the Illini High Twelve Club in Champaign-Urbana. He's also a member of the Ansar Shrine (IL) and the Eastern Illinois Council No. 356 Allied Masonic Degrees. Greg is very involved in Boy Scouts--an Eagle Scout himself, he serves the Grand Lodge of Illinois A. F. & A. M. as their representative to the National Association of Masonic Scouters. That’s how it is in the fraternity. Not just Masons, but other fraternities as well. If the groups are not nurtured, taken care of or shown the love; they will not grow. How do we “Bloom”? Job’s Daughters is a lot like Masonry. We bloom through educational activities, proficiency work and co-activities with other organizations. Just a few weeks ago, Empire lodge #126(Pekin) and two Job’s Daughter Bethels (Pekin #55 and Elmwood #111) got together. We broke bread, had a mock meeting and explained things about our order that I am sure a lot did not know about. The girls performed the living cross and of course there wasn’t a dry eye in the room. How do we “Lead”? Each group has the power to elect either a Master of their lodge or an Honored Queen of their bethel. As members of Masonic groups, how has this helped you to become a leader in your life? Job’s Daughters like Masonry, builds a foundation for its members to develop life-skills, personal growth and community service. They become responsible leaders in today’s society while promoting a balanced lifestyle for God, family, school, and extracurricular activities while having fun – being who they are… and becoming who they want to be! Plant that seed, lead from the front, great things will happen. My Brethren, within the Masonic system the Rite of Illumination is of vital importance in the Ancient Craft Degrees. In each degree the candidate is sent on a search for the light in the darkness circumambulating in the path of the sun. In each journey he over comes trials, in each journey he reaches the apex of his search and finds himself at the altar of masonry. This is the point where the candidate is brought to light and receives the Masonic secrets of that certain degree. This ceremony within the ritual is associated with the moment of creation found in the Old Testament Book of Genesis. The moment of creation begins with a profound and transcendent statement which in Hebrew translates to “ALEM BRA BRAChIT AT EchIM UAT EARTz” or in English “In the beginning God created the Heavens and the Earth.” This first line is profound in the fact that it sums up a cosmos process involving billions of years and innumerable amounts of energy. This universal emanation which manifests in the ‘physical’ in many ways is never to be truly understood by man. It is interesting that at this moment the candidate is brought to light his new life as a mason is created, his new sense of the materialized world around him. The significance of this moment to the Masonic system can only be properly appreciated if you interpret it through the Cabbalistic philosophy. The Cabbala is thought of as a mystical system dedicated to understanding the manifestation of deity. This manifestation is mapped out through a series of steps creating the Tree of Life, which is seen as a path working system which is the foundation for the Scottish Rite. Even in the Ancient Craft there are numerous Cabbalistic influences throughout the ritual veiled behind allegory to hide the secret teachings of the Craft. This divine manifestation begins in the mitts of nothingness symbolized by the Hebrew word Ain, meaning boundless. Ain is seen as the eternal root of all existence. Ain has the characteristic of being incomprehensible in nature, the absolute equilibrium to all which is manifested as a universal state of suspension. This suspension is in turn a sense of nothingness, but this concept should be viewed as Absolute Being not lacking any form of completeness. Ain is seen as “without form or void” complete but without definition. This is the first manifestation of a Transcendent being which then emanates itself as Ain Soph, meaning boundless life. Ain Soph is all potential existence as a condition without polarity incapable of experiencing absence of itself. But life by definition is not completely self-sufficient so is perceived as being reabsorbed back into this state of Being. Ain Soph acts as a way for potential energy to be distributed throughout the substance of the boundless. Ain Soph emanates itself in all directions from its own root which creates life in the image of itself as being diverse in nature and ever existing. This state of Being emanates itself into Ain Soph Aur, or boundless light. Ain Soph Aur is the first witness of Being in the “darkness on the face of the deep” thus making light the universal symbol of the concealed mystery. When God claims “Let there be Light” he is announcing the manifestation of all possibility. Ain, Ain Soph, Ain Soph Aur, form the Triune divinity, the one that is three. This Triune manifestation emanates itself into the first of the Sepera Kether, or the Crown. Kether is the primordial point which manifests within itself the manifested Sephiroth or generative existence or orders. This is the face of the Eternal which is manifested from the causeless. It is manifested as Ehjeh or “I Am” because it is the first cause serving as a channel dissemination of all. The terms heaven and earth from a Cabalistic perspective represents two states of primordial differences, or separation of causes. Heaven can be seen not as a collection of constellations and Earth as a planet, but Heaven representing spirit and the Earth as matter. “In the Beginning” is also a result of mistranslation as Jewish mystics and scholars held that the correct phrase is ‘from that which was first’. The word “created” is often thought to mean a creation of something new, but in the Cabalistic sense it is the generation of the physical, because creation from a human perspective is seen as a formation for something through skill made from elements or materials already available. Creation is a form of expression of the self through internal inspiration and the use of interments and tools used by the Creator. Creation in the Cabbalistic sense implies the formation of things from their root or source. 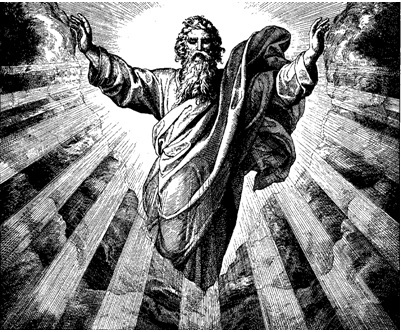 So the first verse of Genesis may be interpreted as “From the eternal principles and essences which are the substances of the beginnings of existence, the forces, makers, or fashioners of the world, the androgynous creator-gods, modeled, sculpted, or carved, and thus brought into manifestation, the substances of the superior and inferior creation, or related archetypally the positive and negative aspects of eternal Being.” (Manly P. Hall 33, Old Testament Wisdom, pg. 97). The word God, or the creator, is not written in Genesis as Jehovah, but appears as Elohim which is a plural word from the Phoenician El. So it is a plural word representing multiple creative energies. Elohim, or the great builders, sat over the face of deep void of Da’at and their motion in the depths of space brought forth the will-born universe. The Elohim are symbolically represented by the invisible energies of the seven sacred planets which have been perceived by deities by all the ancient cultures. “And the spirit of Elohim moved upon the face of the waters.” This shows that Elohim descended upon the void and impregnated its essence upon universal negation. In the original text the word Tohu is interpreted as form, and Bahu as void. Tohu encompasses the creation which emanates from darkness, and Bahu is an abyss of potentiality. So the Elohim did not fashion the physical universe but manifested a vast metaphorical system of energies and power of which the physical creation is the seventh and lowest part manifested. Within in Hindu doctrine this is referred to as “the churning of space” or the primum mobile, or the first motion of Divine power. The consciousness of the individual mason is a reflection of the collected consciousness of Elohim. As within the spheres of the Elohim manifestation of the universe occurs, so in the mind of the candidate the vast metaphorical system of the Masonic universe is manifested. This is significant to the development of the individual consciousness of the individual, because the candidate creates within himself his own manifested universe supported by further developing Masonic mythology and teachings. This is the secret understanding of the Rite of Illumination, to have the spirit of the Deity descend into the dark void of the candidate’s unconsciousness and establish a new world view of the Masonic character. This newly established consciousness is what fuels the mason’s ascension form the darkness of the quarries to the light with the rough ashlars in hand. Upon this consciousness the builder gains the proper tools to sculpt and shape his stone into a true perfect ashlar, it is this understanding that allows the candidate to be raised and discover the divinity within himself and strive toward further aspirations of light. James E Frey, 32° is a Past Sovereign Prince and current librarian of Valley of Danville AASR. Founder of the R.E.B.I.S Research Society he sits on two Blue Lodge Education committees as well as a guest lecturer on Occultism and Esoteric studies in masonry. He is also a Member of the Oak Lawn York Rite, Medinah Shriners, and Golden Dawn Collegium Spiritu Sancti. He also works as a counselor with emotionally and behaviorally challenged children. If you're anything like me, you read the title of this blog, "The Society of King Solomon" and immediately thought "What the heck is that?". Well, I'm here to let you know what it is now that I have not only figured it out, but also have become a charter member. I'm sure you all know how big Freemasonry is in charities, both local and national. 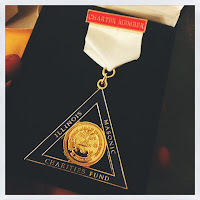 The Society of King Solomon is an Illinois based organization which recognizes extraordinary contributions to the Illinois Masonic Charities Fund. The Illinois Masonic Charity Fund insures that individual charities like the ILCHIP (Illinois Child Identification Program), Masonic Outreach Services and the Illinois Masonic Children's Homes stay operational and funded. Every year when I pay my dues to my home lodge, I always include a bit extra to be put into these charities, but I asked myself "What else can I do?". 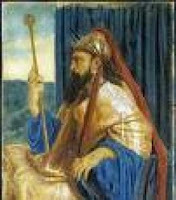 I first heard about the Society of King Solomon at a special Masters Dinner at a local Shrine Club, the Medinah Shrine Club to be exact. While checking in, one of my friends and Brothers, Joe, asked me if I would be interested in donating to the Society of King Solomon, then explained to me that depending on the amount I donated I would get some kind of jewel. But to be honest, I just didn't have that kind of money. After all just an associate membership was five-hundred dollars. After talking to him about it and the director of the program, it turns out that bequeathing also qualifies you for not only associate but also full memberships. That being said, that is indeed how I chose to give to the Society of King Solomon. I asked my financial guy to get me a form so I could update my beneficiaries, I then filled them out and then got those forms to the Grand Lodge of Illinois. After that, I received in the mail, a very nice jewel which I am supposed to wear to all Masonic events. Many of the Grand Lodges across the states have programs which are very similar. I urge you all to look into your Grand Lodge and find out the specifics. If you are in Illinois then click here and it will take you directly to the page on the Grand Lodge of Illinois' website which explains it completely. Remember, even if you don't have the money to give now, bequeathing (giving from your life insurance or other after your passing) is a great option. I know it isn't all that comfortable to think about our own demise, but discuss it with your family and decide together. It is a good cause which deserves our help. Bro. Robert Johnson, 32° is the editor of the Midnight Freemasons blog. He is a Freemason out of the First North-East District of Illinois. He belongs to Waukegan Lodge No. 78. He is also a member of the York Rite bodies Royal Arch, Cryptic Council and Knights Templar, and a member of the Scottish Rite Valley of Chicago. Brother Johnson currently produces and hosts a weekly Podcast (internet radio program) Whence Came You? which focuses on topics relating to Freemasonry. In addition, he produces video shorts focusing on driving interest in the Fraternity and writes original Masonic papers from time to time. He is a husband and father of three. He works full time in the safety industry and is also a photographer on the side as well as an avid home brewer. He is also working on two books, one is of a Masonic nature. Some time back, Greg Knott wrote a piece for the Midnight Freemasons called Connecting With History And Family. It was about an experience we both shared recently. Greg and I attended a third degree at our lodge, and as Secretary of the Lodge, I had the old register out so that our newest Master Mason could sign it as all Master Masons had who came before him. Greg and I got looking at that old register, pointing at names we both knew. Greg found his great-great-great grandfather's signature in that book--truly remarkable. I found the signatures of many old friends, including the man that top-lined my petition--Worshipful Brother Raymond VanBuskirk. I wore Raymond's hat when I was Master of the Lodge, and after he passed away, his daughters gave me his Scottish Rite ring, which is one of my most treasured possessions. And on the same page Raymond signed more than seven decades earlier, was Bro. Joe Silkey. Believe it or not, I had the great privilege of presenting him his 70-year pin when I was Worshipful Master. He passed away last year, but he attended meetings regularly into his 90s. As I looked at those signatures going back to 1877, I realized something. Every man listed in that book signed it as the newest Master Mason in our lodge--many as young men just as their life was truly beginning. They were embarking on a new adventure in search of light, and some of them found it in our Lodge. Freemasonry became important to them. It may have changed their lives in some fundamental way as it continues to do for so many of us today. Many went on to serve as officers in the lodge, and forty-six of the men who signed that book served as the Worshipful Master of our Lodge. But what occurred to me was that when they signed that book, there was nothing below their name. What came after them was still in the future. Each signature forming a link in a long chain going back to the beginning of the lodge in 1877. But they probably didn't understand back when they signed that register that they were responsible for what was to come after. All those signatures in our book are links to our past--all that came before. But those that sign it last represent the bridge to the lodge's future. What's important is what we do today, because what we do today is what keeps the lodges strong, and our traditions there for future generations. And maybe, if Greg and I are very lucky, in seventy years or so, two Masons will be sitting at my old desk in the lodge and pointing at our signatures in the register . . . instead of paying attention to the degree like they should be. Todd E. Creason, 33° is the founder of the Midnight Freemasons blog and continues to be a regular contributor. He is the author of several books and novels, including the Famous American Freemasons series. He is member of Homer Lodge No. 199, and a Past Master of Ogden Lodge No. 754 (IL). He is a member the Scottish Rite Valley of Danville, the York Rite Bodies of Champaign/Urbana (IL), the Ansar Shrine (IL), Eastern Illinois Council No. 356 Allied Masonic Degrees, and Charter President of the Illini High Twelve in Champaign-Urbana (IL). A few days ago I was driving through a neighboring town to run some errands. As I passed by the Masonic temple a mural on the side of the building caught my eye. I have seen this image a hundred times on the internet. A composite of famous Freemasons gathered together in a painting. Movie stars, politicians scientists and cowboys with one thing in common, during their life they had all been members of the craft. I smiled as I drove by the building. A warm feeling was inside me because I too was a member of that Fraternity of great men. As I was driving my mind began to wander. The reason that mural existed was to show the outside world the great men who once were Freemasons and encourage them to ask for a petition. It’s a great source of pride for us who are members and a great recruiting tool but that mural only tells part of the story. There are other “Great Masons” we never discuss. 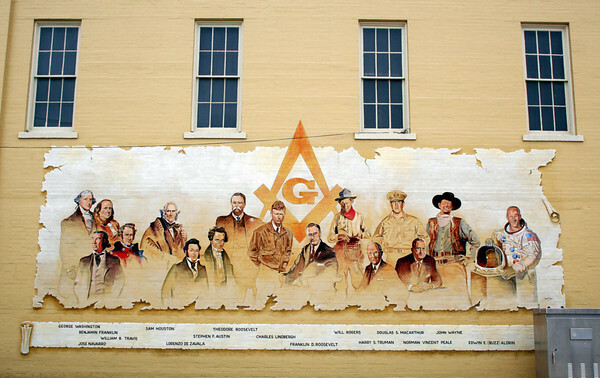 For every Famous Mason on that mural there are several thousand unsung great Masons who serve this Fraternity every day without thoughts of honors or pay of any kind. Brother John Smith comes into the temple twice a week to clean the building. Several hours a week he sweeps floors, cleans the restrooms, restocks the supplies and makes sure everything is spotless so when the members arrive the place looks and smells good. Brother Smith does such a good job no one ever thinks it ever gets dirty. Worshipful Brother Marty Jones. Marty works with the new members helping them learn their work. He is very patient with the newly obligated Brothers, listening to their repeat the same phrases over and over, helping them with their pronunciation. Most of all giving them encouragement and answering the questions they might have. Brother Gordon Brown. Brother Brown retired from his job a few years ago and felt something lacking in his life. Gordon began volunteering at the local Veterans hospital though the Masonic Service Association helping recuperating veterans write letters, talking to them and providing comfort for those who served their country. Bill Hosler was raised in 2002 in Three Rivers lodge #733 in Fort Wayne, Indiana. He served as master of the lodge in 2007 and was a member of the Internet committee for the Grand Lodge of Indiana F&AM. Bill is currently a member of Roff lodge #169 in Roff, Oklahoma and Lebanon lodge #837 in Frisco, Texas he is also a 32° Scottish Rite Mason within the Fort Wayne, Indiana Valley AASR NMJ. Bill has also served as High priest of Fort Wayne Chapter #19 Royal Arch masons and Commander of Fort Wayne Commandery #4 Knights Templar and the Webmaster and magazine editor for Mizpah Shrine in Fort Wayne, Indiana. Chicago is one of the world’s greatest cities and has a long Masonic history. For a while the old Chicago Masonic Temple was the tallest building at 302 fee within the world. But did you know that the Magnificent Mile – Michigan Avenue is anchored by a Masonic Cornerstone? I wasn’t aware of this fact either until I happened upon on it while walking Michigan Avenue. Michigan Ave. is widely known for its shopping attractions. 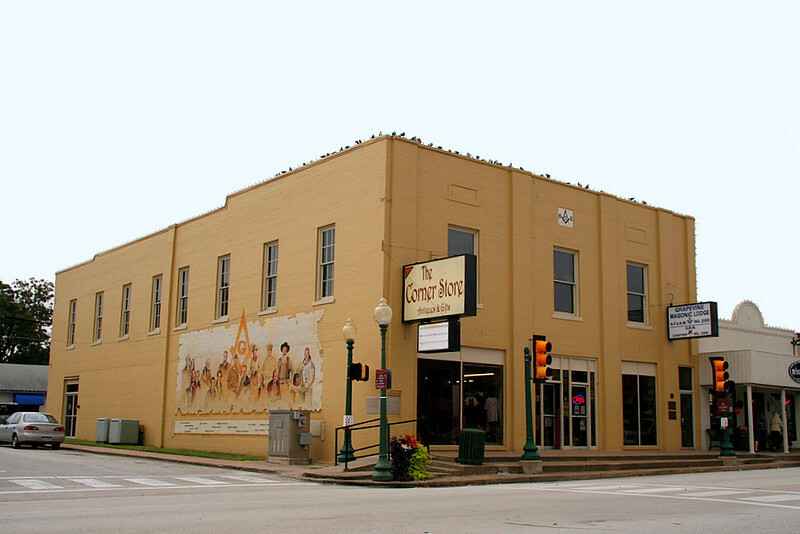 Many modern retailers have taken up shop within the area and offer shoppers everything their money can buy. 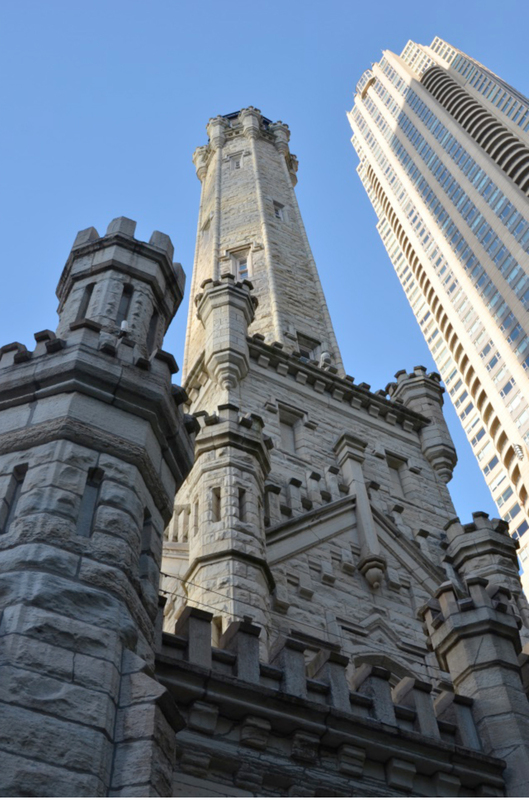 The most famous landmark along Michigan Ave is the Chicago Water Tower. The Water Tower was built beginning in 1867 and finished in 1869 by architect William W. Boyington from Joliet Limestone. The structure was one of the few survivors of the Great Chicago Fire of 1871 started by Mrs. O’Leary’s cow. It stands 154 feet high and a physical linkage with the Chicago of old. When I started examining the building, I found that it contained a Masonic cornerstone properly laid in the northeast corner of the structure. I was pleasantly surprised to find this connection in the now fully commercialized area. 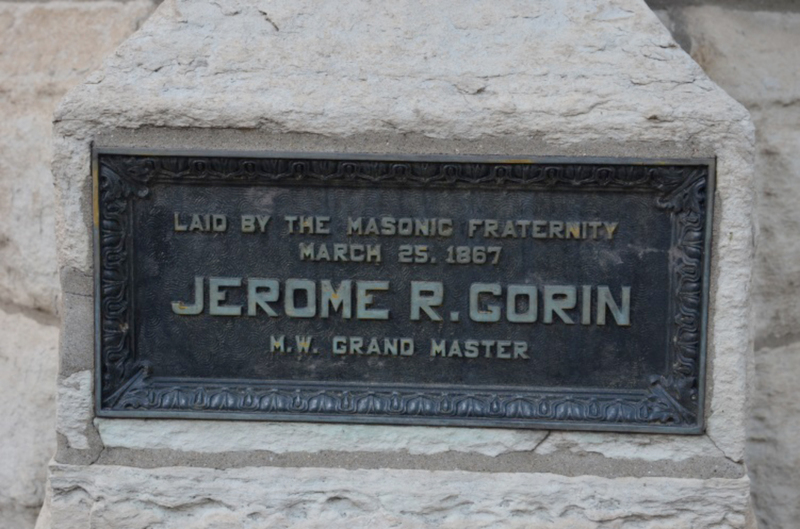 The cornerstone contains the name of Jerome R. Gorin Most Worshipful Grant Master. So who was MWB Gorin? MWB Gorin was Grand Master of Illinois in 1867 and 1868. He was born in Hopkinsville, KY on October 12, 1817 and moved to Decatur, Illinois in 1833. He was an attorney who served in many capacities including city clerk, elected the Illinois legislature and a well-known banker. 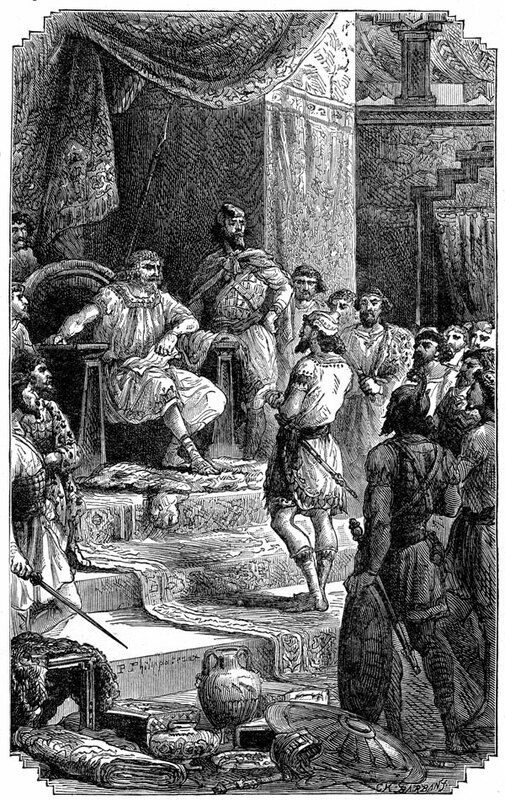 While MWB Gorin was in office, the Knights Templar of Illinois, formed a commandery at Olney, Illinois which was named in his honor. Today Gorin Commandery No. 14 is still active and is located at Bridgeport, Illinois. So next time you are visiting the Chicago Magnificent Mile, keep in mind the Masons were there first to anchor the way! 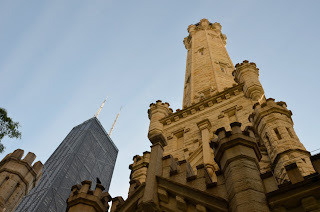 The Old Chicago Water Tower with the John Hancock building in the background – named after another famous Freemason, Brother John Hancock. WB Gregory J. Knott is the Past Master of St. Joseph Lodge No. 970 in St. Joseph (IL) and a plural member of Ogden Lodge No. 754 (IL), and Homer Lodge No. 199 (IL). He's a member of both the Scottish Rite, and the York Rite, and is the Charter Secretary of the Illini High Twelve Club in Champaign-Urbana. He's also a member of the Ansar Shrine (IL) and the Eastern Illinois Council No. 356 Allied Masonic Degrees. Greg is very involved in Boy Scouts--an Eagle Scout himself; he serves the Grand Lodge of Illinois A. F. & A. M. as their representative to the National Association of Masonic Scouters. I found a metal file box while I was rummaging through a closet recently. When I opened it, I discovered a treasure-trove of things my parents had saved. Among the items were World War II ration books. I'm certain they belonged to my mother, because at the time my father was slogging his way across North Africa, up through Italy and into France. You've seen the maps. My parents, Robert and Alice, were part of that industrious, young and determined group that really did save the world; and for good reason we now call them "The Greatest Generation." People of that era made sacrifices unimaginable to most of us, now living in what Time Magazine has dubbed the "Me Me Me Generation" — not to be outdone by the "Me Generation" of the 70s. Duuude, only having one "Me" to define your generation would be lame. I'm not sure what all of Mom's coupons were for, but I know for sure the U.S. rationed gas, food and other items. People were encouraged to recycle tin cans for the war effort. Children even donated their metal toys to help. Each family was allotted five tires (for one family car), and had to give any others to the government. Even the fact that we are at war today does not affect us like that. Most of us, apart from families with loved ones in the military, may make some sacrifices but not on such a large scale. The material shortages ran so deep that it even affected, at least in one small way, the Freemasons. When Dad returned from the War, he joined the Fraternity. Although peacetime had returned, production had not caught up with demand and certain things remained hard to get. 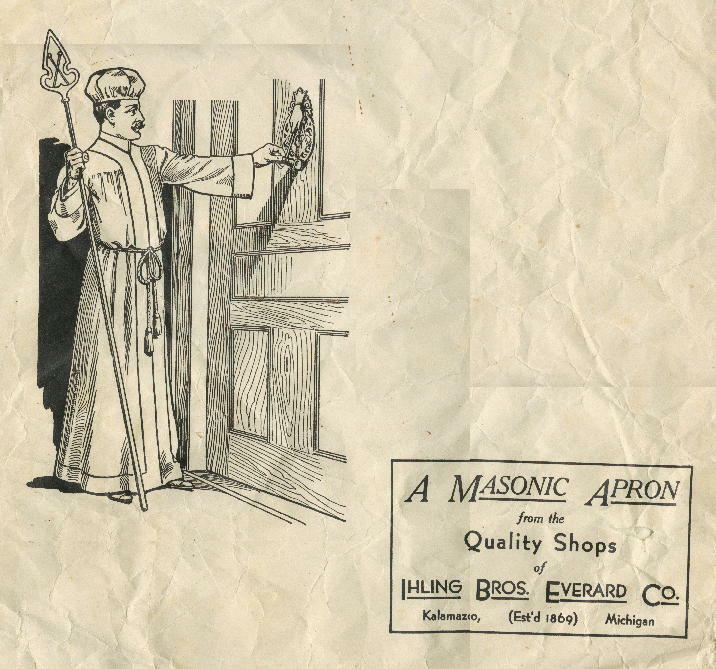 In Dad's Lodge and many others, it was customary to present a new Brother his apron in a cellophane envelope, suitable for its protection. Cellophane, however, was in short supply and his Lodge had to use paper as a substitute. Our fighting men need cellophane and its ingredients. 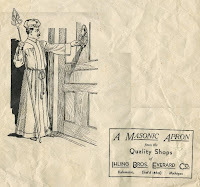 For that reason the protection cellophane formerly gave our Masonic aprons has to be eliminated. This white paper stock will carry on for the duration. That envelope, having done its job, now hangs framed on my office wall. Someday it may reside in our Masonic Museum or Library, a symbol of one of the small sacrifices of a great generation. Steve Harrison, 32° KCCH, is a Past Master of Liberty Lodge #31, Liberty, Missouri. He is the editor of the Missouri Freemason magazine, author of the book Freemasonry Crosses the Mississippi, a Fellow of the Missouri Lodge of Research and also its Senior Warden. 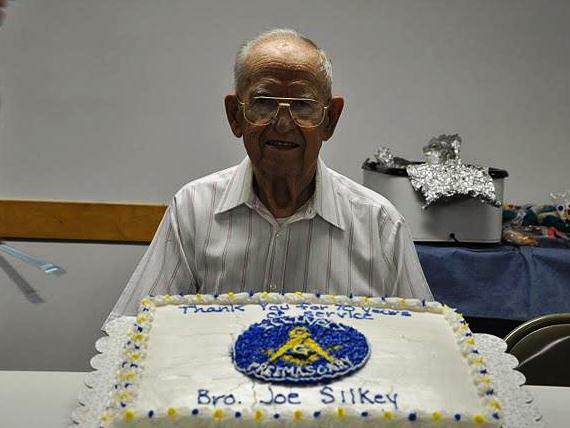 He is a dual member of Kearney Lodge #311, St. Joseph Missouri Valley of the Scottish Rite, Liberty York Rite, Moila Shrine and is a member of the DeMolay Legion of Honor. 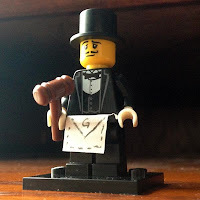 So if you recall, some time ago I wrote a post about my adventures in building a Lego Masonic Lodge room in which I used the Lego CAD program and I also, using my sons toys, built a Worshipful Master out of his existing pieces. It still stands on a shelf in my office. Well the other day I took my three sons to see a movie and as usual there were previews for new coming attractions. One of which was the official Lego Movie, and the main character's name is Emmet. My son's name, the one into Legos is also named Emmett. The difference being just the last "T" in his name. 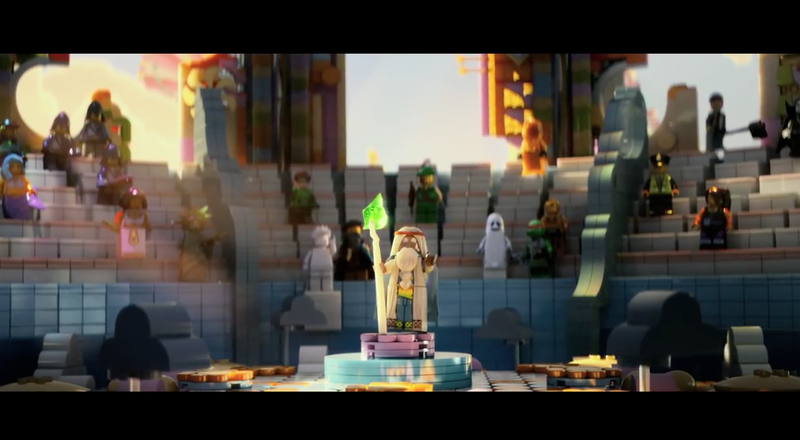 Morgan Freeman (a wizard) starts to talk to the main character in this large hall and he says "My fellow Master Builders..." then he goes on to name some of the other Lego men, most of which being Legos representation of several pop culture personas. 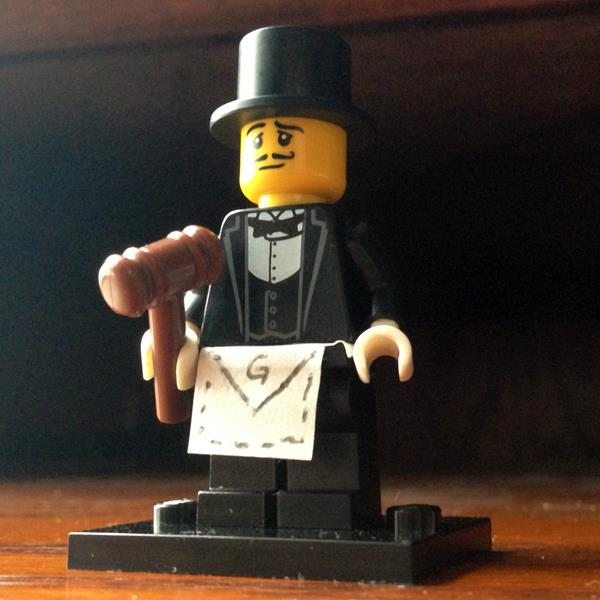 As the screen pans across, and you can catch if you're quick enough - there is a strange Lego man in the background, in fact the only one sitting on a thrown or chair, wearing a top-hat and holding a gavel. I took the liberty of grabbing some screen shots. Have a look for yourselves. 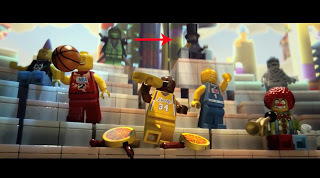 Perhaps someone involved with the film was a Freemason and decided to throw that in there or perhaps someone was just having fun, much like I was when I built the Lego Lodge. Happy building! So, I found myself browsing Mackey's Masonic encyclopedia as I often do when I am looking for something interesting to research, when I came across an entry titled "Tyrian Freemasons". I immediately stopped to read the entry because I was intrigued by a couple words I saw in the paragraph, namely; Dionysian and Solomon's Temple. So who were they? In short they are said to have been Freemasons who were Phoenician, from Tyre and members of a group called "The Society of Dionysian Artificers". The story goes that Hiram King of Tyre sent these Freemasons to help King Solomon build the Temple. These Tyrian Freemasons were masters in both operative and speculative masonry. According to this entry, the Freemasons in Jerusalem and those working on Solomon's Temple, were only masters in speculative Masonry having learned what they knew from Noah. Eventually these Tyrian Freemasons combined a system of operative and speculative both, which lasted for centuries. Whether true or not, I thought it was an interesting idea. Especially if you followed Bro. James E. Fry's series recently called "Son's of the East", where he dove into some of the interesting facets of the Phoenician designs used in the building of the Temple. While recently at a 3rd degree in my home Lodge – Ogden Lodge No. 754, the lodge by-laws and constitution book were on Secretary Todd Creason’s table. I started thumbing through the book and looked at the signatures of our many members since 1877. 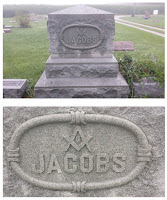 To my pleasant surprise I saw the name of my Great-Great-Great- Grandfather Mathew Jacobs who was a charter member of Ogden Lodge. 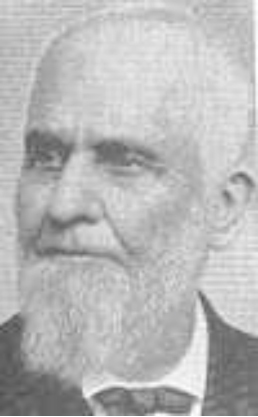 Mathew Jacobs was born on February 26, 1843 in Allegany County, Maryland on the family farm near Lonaconing. On September 12, 1861 he enlisted in Company A, 3rd Regiment, Potomac Home Brigade, Maryland Volunteer Infantry. He saw action at Grass Lick, WV and during the siege of Harper’s Ferry, and did duty at Annapolis, MD and in the defense of Baltimore. Jacobs was discharged as a Corporal on January 2, 1865 at Buckhannon, WV. Family tradition holds that the Jacobs family was divided with some fighting for the North and others for the South. 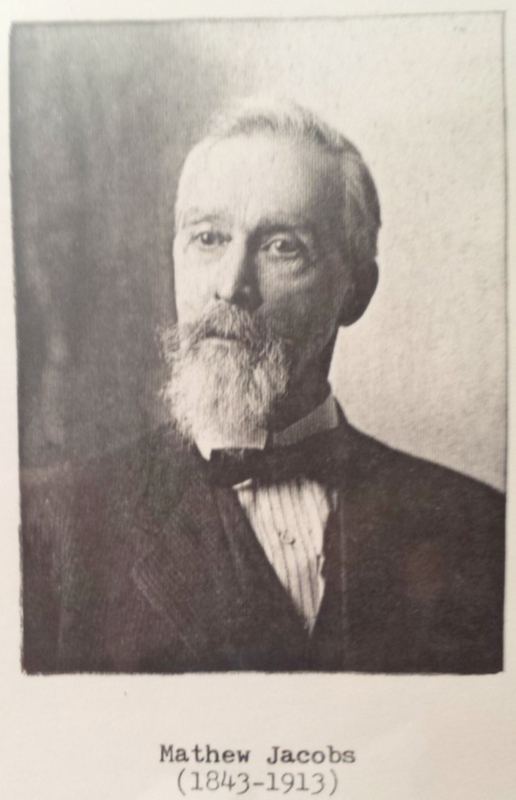 After the war he lived at Point Bluff, Indiana for 4 years and in 1869 moved to Colfax Township in Champaign, County Illinois with his brother Nehemia Jacobs. In 1877 Mathew moved to Ogden, Illinois on a farm 1 ½ miles NW of town. Mathew Jacobs grave in Mt. Mathew married Susan McMillen on September 4, 1874 and together they had three children; Charley Jacobs (1876-1947), Lulu Jacobs Leigh my G-Grandmother (1874-1972) and Ethel Jacobs Gordon 1888-1980. Susan McMillen Jacobs died in a tragic accident on June 21, 1895. Her horse was spooked when going down a hill and ran out of control, throwing Susan from the buggy. After Susan’s death, Mathew continued to live on the farm near Ogden, until his death on March 5, 1913. Mathew is buried at Mt. Olive Cemetery, Mayview, Illinois. I know very little else of Mathew’s Masonic record. 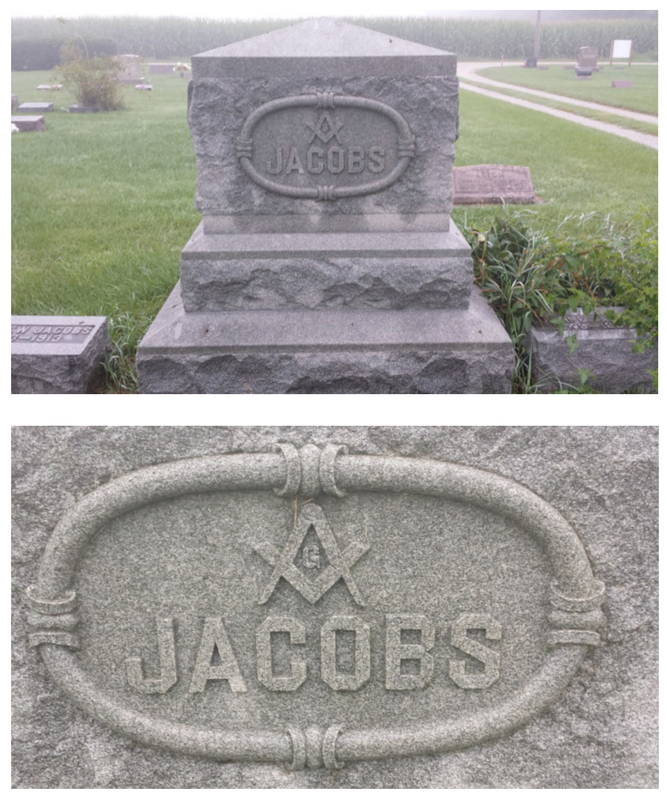 He must have been a proud member of the fraternity, as his tombstone has a prominent square and compass on it. I had the privilege sign the same book as Mathew Jacobs, 130 years later. One of our fraternity’s strengths is that shared experience across the generations. Though I never met Mathew Jacobs, I have literally been able to walk in foot-steps on this journey. Some time ago I presented a piece about becoming a lodge officer. I briefly touched on the duties of some of the positions you might find yourself in. However those duties have not always been the same. Many of the duties prescribed to certain lodge officers have been eliminated. What duties you might ask? Well how about someone to wipe the floor? In the 1700’s all the way until the early 1900’s there were lodges that met in rented out rooms, after hours which had dirt floors. The members would draw the working tools and much of the symbology we use right on the floor in dirt to explain them to new candidates. When the meeting was over, a member, usually the tyler or perhaps the stewards would literally mess the dirt around the floor to conceal any and all traces of things that had been drawn. You have no doubt heard the Worshipful Master of your lodge say that “...if sooner specially convened, due and timely notice will be given by summons or otherwise.” In the 1700’s and 1800’s according to many Masonic scholars, the deacons would need to write out these summonses and it was the duty of the stewards to hand deliver them to the brothers of a lodge living throughout the land. The duties we had to the craft in centuries past may have been different—I don't think anyone has to wipe down a dirt floor or hand deliver summons notes—but we do have brothers in lodge who are charged with managing a social media page for their lodge, managing a call-them-all phone system to advise members of upcoming events or maintaining a lodge website. Whatever our duties are today and regardless of how time has changed those duties, let's do the best we can. Your lodge is counting on you.